It's getting hot out there, folks. I have a feeling summer will be brutal and will come quickly this year for the East Coast. I'm pretty sure the amazing people who ran the Boston Marathon in record temperatures would agree - I followed updates from the race online and all I can say is WOW. People are amazing and inspiring and borderline crazy to run 26.2 miles in pure heat. I got my own preview of the heat on a run yesterday evening - luckily there was plenty of shade but I could feel the heat draining me. I can also tell that I'm not getting enough electrolytes post-workout; my calves and feet have been cramping like crazy after a hard run or gym session and it seems to get worse with the heat. Running the 10K - definitely wasn't warm that day! Hot, long, and sweaty (TWSS) workouts indoors and outdoors require more than h20 hydration. This is usually where sports drinks like Gatorade, Powerade, and even coconut water step in. With the exception of coconut water, I've never been a fan of sports drink - they're just too syrupy sweet for me. Coconut water is a good choice but I try not to drink anything with sugar so I tend not to drink it. Lemons: Lemons are not only detoxifying to the liver but also provide a great hit of potassium - an essential electrolyte- and has lots of other benefits. Salt: Salt is essential for electrolyte balance. I tend to be a super salty sweater and crave salt after a difficult workout so I made sure to include enough salt in my drink. 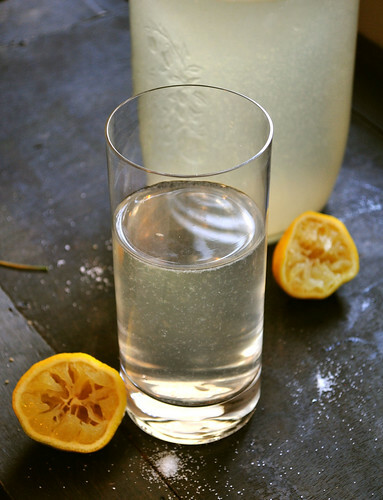 Ginger Water: Ginger is delicious, helps ease stomach problems, and may even help with muscle soreness and recovery. Easy, natural, and cheap. That's my kind of drink. 1. Cut ginger into large coins and place into a large pot. Add water. 2. Bring water to a boil and then simmer for 15 minutes. Shut off heat and let the ginger water steep until cool. 3. Add liquid stevia to taste and store in airtight container, pitcher, or jar in the fridge. 1. Mix all ingredients together into a large jar or pitcher and stir to combine. Refrigerate and now you have a healthy, natural sports drink!